Peter Hollens is one of Youtube’s most ‘popular-yet-not’ artists I’ve ever heard. ‘Peter who?’, you ask… ‘And where did he come from? Is he famous?’, are probably questions that you have swarming around in your head- and why is he suddenly worthy of myself devoting a whole entire review on one of his albums? Well let me quickly tell you about how I stumbled upon Peter’s ingenious music and unique cover videos. Last year sometime, I was just browsing other music websites the other day (such as Jesus Freak Hideout, New Release Today, Jesus Wired, The Christian Beat. CM Addict etc), as you do when you’re just browsing the internet, and admiring the ‘healthy competition’ amongst my brothers and sisters in Christ; when I stumbled across a news article– that detailed the release of a cover video from Jamie Grace and Peter Hollens. Both vocalists collaborated to cover Linkin Park’s “Heavy”, and while I hadn’t heard of Linkin Park’s music, and still haven’t (nor Peter at the time), I did know Jamie Grace’s music, and hence I checked out the cover collaboration. Boy was I blown away. Of course by Jamie’s singing (she’s awesome at anything she sings), but more so by Peter. By his stellar and near-flawless voice, yet also with his ability to create musical masterpieces from his acapella melodies. Yep, in all of Peter’s youtube videos, he does not play any instruments. All ‘instrument sounds’ come from himself, which is pretty cool by the way. So I checked out Peter’s music, and I realised that though he’s a musical genius, he’s still relatively unknown, even after being in the music industry for a number of years. And I reckon not many of us know his stuff, predominately because he’s not signed, and not a well-known mainstream artist…yet. And though I can’t find any actual confirmation about whether or not Peter is a Christian or not, and the fact still does remain to be seen as to why New Release Today actually posted an article about him; I reckon his music is so, so good- so let me briefly touch upon his latest album The Greatest Showman Acapella and let you know that this inspiring work of art is one of my favourite albums of the year thus far. By now you all know what The Greatest Showman is all about, right? If not, well, you can read my brother Jon’s review of the movie here, as well as my review of the original motion picture soundtrack, and then go watch the movie- pronto! Finished yet? Good! And so since you’ve now seen the movie and heard these songs, there’s only one more thing to say. That while Peter sticks close to the originals on all of the tracks, it’s insane to comprehend that all of these impacting, inspiring and heartfelt renditions all are recorded exclusively through voice and voice only. 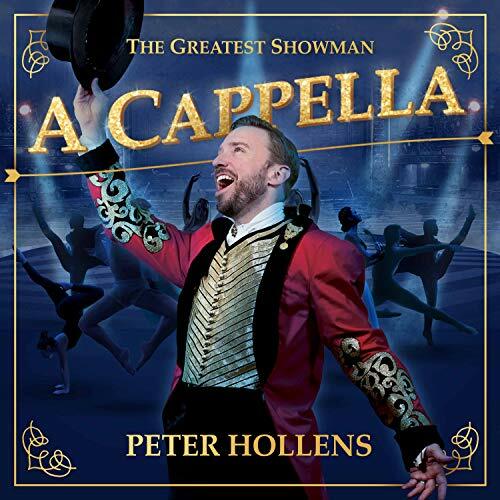 An acapella album, and of well-known movie-soundtrack melodies takes hard work and guts; and Peter Hollens has pulled it off in style. With personal highlights “From Now On”, “This Is Me” and “A Million Dreams” all enhancing the original recorded versions; Peter is one artist that you all need to take notice of in the near future. The Greatest Showman Acapella is acapella music at its finest, and a must listen if you love artists like Pentatonix, Avalon and Jordan Smith. Yet as we listen, we must remember that this album isn’t a replacement for the original soundtrack- in fact it only is a companion album. In any case though, Peter’s work is to still be admired for being simple a fantastic album. And for those of you who aren’t fans of Peter’s music after this- I guarantee it that you will be after this. So what are you waiting for? Are you ready to hear the songs of PT Barnum in acapella format?